Campaign background: Students at the University at Buffalo are working to address the dramatic increase in privatized workers on their campus that are being used to replace retiring union workers. This is a tried and true administrative tactic to drain the power of the union while at the same time getting away with paying their workers less and not providing benefits. Students believe that equal work means equal pay and so are demanding that the contracted janitorial workers have wage parity with the directly hired janitors and receive the same benefits. UBSAS isn't going to let UB get away with trying to act more like a corporation than like a university that respects all members in its community. Students have been holding weekly worker appreciation breakfasts on both their North and South Campuses and hope to have a picnic at some point this spring for students, workers and their families. 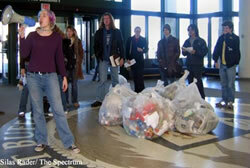 On April 1, 2006, UB adminstrators made an announcement to cease contracting out custodial work at the university. Over the next three years, the contracted janitorial workers will be gradually insourced and in turn represented by the existing union on campus CSEA local 602. Their wages are expected to increase up to $10.60/hour and they will also be receiving state health benefits. While this is great victory, the students are saying that there is still work to be done to ensure that this decision is implemented in a way that respects the current workers, that is, ensuring that they are prioritized for these new unionized positions. The students are demanding that the university move forward in a transparent, fair and just way.